KUALA LUMPUR: Land & General Bhd (L & G) has been recording encouraging sales numbers despite Bank Negara's move to implement responsible lending to contain surging household debt. L & G currently has three ongoing projects, two of which are residential projects Elements@Ampang and Damansara Foresta. The other is 8trium, a commercial project. 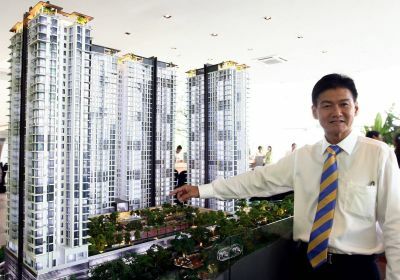 Managing director Low Gay Teck said that for the months of February and March 2012, 100 units of Elements@Ampang had been booked and sold. The project has a total of 1,040 units and is currently selling for RM850 per sq ft. The bookings and sales for February and March 2012 have amounted to about RM60mil. Its residential development Damansara Foresta in Sri Damansara has recorded almost a 100% sell rate in both Tower A and Tower B. In Tower D, more than 15% have been sold. Tower D has not been officially launched yet. The buyers were either from the company's database or have registered with the company. The Damansara Foresta units, which range from 1,400 to 1,600 sq ft each, are currently selling for about RM600 per sq ft from RM500 to RM550 per sq ft. The project is due for completion by end-2014. The 8trium project, which is also located in Sri Damansara, is expected to be completed in two months. The project has had a sell-rate of about 93%. At the company EGM yesterday, the proposal for L&G to provide further financial assistance of RM43.86mil to its subsidiary Elite Forward Sdn Bhd was approved by the shareholders. Elite Forward, which has a 50.01% stake in Elements@Ampang, is undertaking a joint venture with the Mayland group. The project, which has a gross development value of RM700mil and will cost RM460mil to build, is due for completion in June, 2014. L & G was also exploring land acquisitions to expand its land bank in Johor Baru, Penang, and the Klang Valley in the next six months, Low said.